I still remember my days in the green without any GPS device. Let alone a good shot finding the targets were difficult. Moreover, I had no clue about the hazards, doglegs, and other hindrances. Things change dramatically after my wife gifted me the best gift in our anniversary. It was a Garmin Approach X40 GPS Golf Band. It turned my game as well as my daily activities. Now I can enjoy both Golf in the green and Healthy Lifestyle in Home. 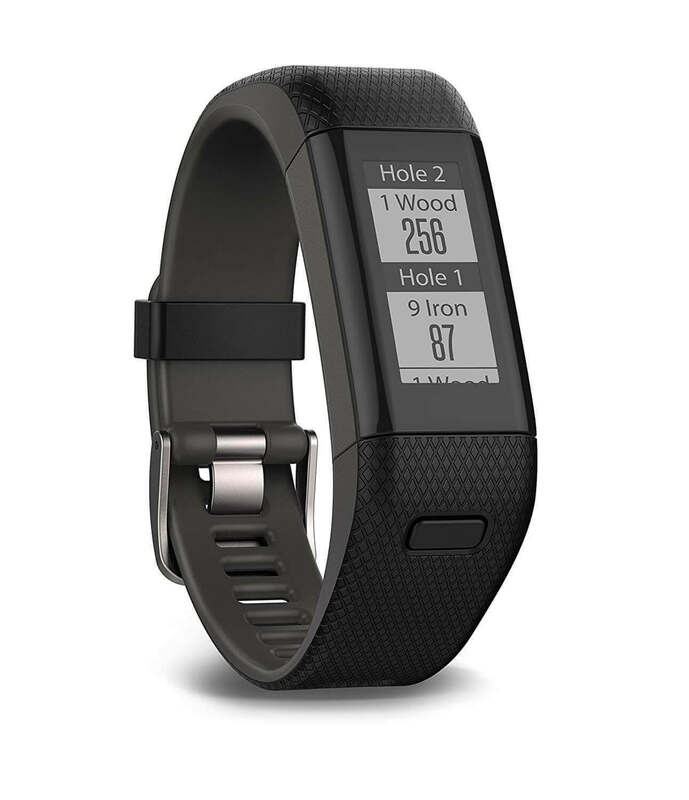 The Garmin Approach X40 is a blend of Golf and Fitness Tracking in one device. Its sleek design and color variations make it a style statement for any golfer. You can monitor your heart rate with this golf watch. The Elevate wrist heart rate technology measures your heart rate for 24/7. Additionally, Garmin Approach X40 provides calories burned information using the heart rate. Only this sleek model of Garmin watch gives three features in one stylish band. They include GPS, fitness tracking and smart notifications. It also comes with 40,000 preloaded golf courses worldwide. No matter where you are, Approach X40 will go-anywhere with you. It knows your location and distance from the next pin. This high-sensitivity GPS gives you the required distance data to go for the green. The low-profile wristband of this smart watch is durable and comfortable. Moreover, it is versatile. The device is water resistant up to 50-meters. No matter where you are in the green, the touch screen display will accurately show your distances to the front, back and middle of the green. You can reposition the pin manually to game day’s location in the Green View. Garmin Approach X40 gps watch has automatic shot detection technology. This Auto Shot tracking detects shots and measures distance for post-game analysis. This quick Garmin Golf watch work as an extension of your cell phone. You can read all your emails and texts on your smart hand watch. It is not a problem anymore if you have your cell phone tucked in your golf cart. Your Garmin Approach X40 will connect you with the golfer's community through Garmin Connect. It will help you to compare your games with pro golfers. The watch also has a digital scorecard. It will keep track of your score from each game. With Garmin connect you can analyze and even share your best 18 with your friends. This Garmin golf watch will also analyze your shot patterns. You have to attach the TruSwing club sensor with your best gold club. It will measure up and downswing to give you the best-fit swing style. How do Garmin X40 track heartbeats and calories? This hybrid device measures the heart rates by Elevate wrist heart rate technology. You will found an elevated part at the back of the device. Just like other activity trackers, it monitors the pulse rate with direct contact with the skin. Thus, you can rely on it. Based on your pulse, Garmin X40 can measure burned calories. The equation is simple. High heart rate generally associated with intense calorie burn. Hence, this smart device can tell you how many calories you burnt. It will provide 24/7 data for your activities. The best thing is you can see an analysis of the stats later. How do you update your Garmin X40? Your Garmin X40 GPS Golf band comes with most updated software and course information. However, you need to update them regularly to stay ahead from your opponents. Garmin Express is the gateway to update your device. You can install this software(android)(apple) in any Desktop or Mac device. Do you have a Garmin account? If not, create one, it is easy. Garmin Express will provide Map and Software Updates for your X40 device. Moreover, you will receive Chart and Golf Course updates. Even though the device has 41,000-course information, sometimes minute changes happen in those courses. To get your winning shot, you need the course updates regularly. How can you reset the Garmin X40? Sometimes this best golf GPS device does not work up to the per. Do not worry nothing is serious there. You have to reset the device. Resetting the device is almost like restarting your smartphone. Hold the device key up to 10 seconds. It will reset the device and make it ready to use again. You have to hold the device key for 1 second. You will find a refreshed device after this. How can you maximize battery life? There are many ways to maximize the battery life of your Garmin X40. If you can turn off Auto-On Backlight settings, you will found a much longer battery life. Additionally, you can decrease the backlight brightness to maximize battery life. When you do not need the smartphone notification, try to turn it off. It will save some juice for the device. In the same way, turn off the Bluetooth if not necessary. I do the same for my smartphone. It keeps me away for a sudden power cut! ​​​​What are the diff​​​​erences between Garmin Approach X40 vs. S20? Garmin Approach S20 and X40 Golf watches are designed for different purposes. Therefore, they fulfill particular goals with various features. Garmin X40 has a touch screen. You can access the information with your touch. However, this feature is not available in S20. You have to use the power button to toggle between functions. The X40 golf watch notifies everything with a vibration. This is a great feature when you do not have time during your 18 holes. Garmin S20 only shows the notification but no vibration. You will get a sleek look and smaller dimension with Garmin X40. Nevertheless, Garmin S20 is bigger and heavier than its X40 counterpart is. The Garmin Approach X40 comes with heart rate monitor. However, S20 will give you the cheaper price tag during a golf GPS watch sale. Additionally, you will get longer battery life from Garmin S20 Golf watch. Garmin Approach X40 is a lifestyle Golf GPS wristband. It will not only make your golfing easy but will also track your daily motions. If you want to maintain a healthy lifestyle and winning attitude, get an X40. You can start healthy habits with this affordable activity tracker wristband. Thus, do not wait for the Black Friday deals. Get one right now to have both excellent golfing and activity sessions.